Eric Bischoff is credited with creating the Elimination Chamber. This Sunday, WWE will present its seventh Elimination Chamber pay-per-view event featuring the stars of SmackDown Live battling for supremacy on the road to WrestleMania 33. Most notably, the event will be headlined by an Elimination Chamber match for the WWE Championship featuring John Cena, AJ Styles, Bray Wyatt and other top talents. The Elimination Chamber match has been one of WWE's signature match types for nearly 15 years, and since 2002, 20 in total have been held, including the upcoming instalment. Some have been better than others, but there have been an elite few Elimination Chamber matches that could be called classics. Ahead of the pending pay-per-view, let's look back at the five best bouts to take place inside Satan's Prison. And as iconic as these matches were, perhaps the best is yet to come. Before the Elimination Chamber was given its own event in 2010, there was No Way Out, which ran from 2000 to 2009. 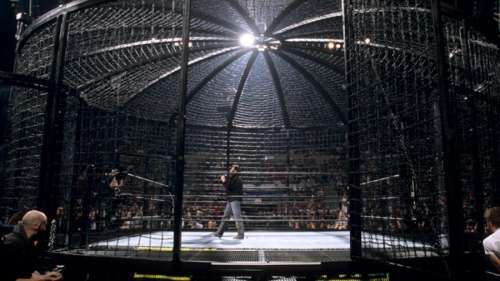 In its final years, it featured a pair of Elimination Chamber matches, and in 2008, two Chamber matches were held to determine the No. 1 contenders to the WWE and World Heavyweight Championships. Between the brands, Raw's Elimination Chamber match stole the show in the main event slot, and how could it not, when all of the flagship show's biggest names were involved? Triple H, Shawn Michaels, Umaga, Jeff Hardy, JBL and Chris Jericho all had WrestleMania on their mind and were willing to do whatever it took to punch their ticket to the Show of Shows. Perhaps the best part of the match was how unpredictable the outcome was, and each individual had their time to shine. Jeff Hardy came close to clinching glory, but ultimately, it was Triple H who had his hand raised by hitting the Charismatic Enigma with a Pedigree on top of a chair.